NEW 2016: A film of Tahoma painting is discussed below, with a link to that film. NOTE: Although we are not regularly adding new content to this site, we hope that you will find something of value here. Please feel free to leave comments on the posts, as we continue to monitor them, or contact us at our e-mail addresses, which you can find us at these addresses: Charnell or Vera Marie. Please be aware that we do not do appraisals. Navajo Artist Quincy Tahoma (1918-1956), a highly gifted painter, studied at the Santa Fe Indian School along with other well-regarded Indian artists such as Harrison Begay and Andy Tsihnahjinnie. Art teacher Dorothy Dunn encouraged her students to paint in a flat and decorative style specific to early 20th-century, studio-taught painting, but Tahoma incorporated more action and varied techniques in his work. Born near Tuba City, Arizona, the artist spent most of his life in Santa Fe, New Mexico, producing hundreds of paintings over two decades from the mid 1930s to 1956. Due in large measure to his premature death, Tahoma’s contribution to Native American art, as well as the triumphs and tragedies in his life, have remained somewhat invisible to the generations that followed. Following the maze of information about Quincy Tahoma’s life (1918-1956) has consumed well over ten years. At times we were tempted to abandon the biography, and instead, write the live mystery story that we were living. This blog will begin to tell that backstory. Although his paintings are acclaimed, and people still compete at auctions to own one of the several hundred paintings he left behind, few people could answer the basic questions that Charnell started asking back in 1995. Where was he born? When? Were there family members still living? Where did he learn to paint? What and who were the major influences on his art? Many compendiums of information about American Indian Artists include short biographies of Tahoma. As soon as Charnell and Vera Marie were able to find people who knew Tahoma during his lifetime, they learned that very few of the “facts” published about him were correct. For instance, a couple from Bennington College visited Santa Fe and filmed Tahoma at work. (The photo above of Tahoma painting, is from that film). They showed many things that were not true to life–Tahoma painting while wearing fine silver jewelry and velvet shirt rather than the plain jeans and shirt he wore in real life; Tahoma building a hogan, when he lived in apartments after he graduated from high school, never a hogan after he was about 8 years old. But the films do show him painting, which is priceless. This blog reveals some of the backstory of writing a biography of a Navajo artist, born before birth records were kept. To complicate matters, he invented much of the information about his origins that he shared with friends during his lifetime. We were fortunate to interview more than fifty people who either knew Tahoma personally or knew him through stories of their parents or other relatives. IMPORTANT: To read more–check the archives, search or categories boxes on the right hand side of this page. I own a painting by Tahoma. It is at once captivating, but yet there are strange things about it. My grandfather described these anomilies as “screwy.” I have done some research and found that this one is his style, but I have not reviewed enough of his paintings to be able to say whether or not this one is “screwy” in comparison to others. It is signed with his last name and appears to be dated in 1946. On the painting this is represented with the four over the six, and the downward stroke of the four connects with the top of the six. It sure looks like a date but I have no basis to make that judgement. It is framed and has been for as long as I can remember. We modernized the frame around 1994, as the origional was huge and did not appear to flatter the work. If you would like I will send a photo. If you would consider taking a look I would appreciate it. Thank you for your time. Thanks for letting us know about your paitning, David. I have e-mailed you about it, but on reading your note, I am intrigued to know whether this is an authentic Tahoma, painted on a bad day, or just creative! I was able to access a few more pics of Tahoma’s work. In my very uneducated opinion, it is the same man. The signature in yellow appeared almost identical. However, I will take a picture and attempt to send it along for you to look at. My Grandfather was the superintendant of the School for the Deaf there until the early ’60s. There is a very good chance he actually knew the man. My father, a Scots-Irishman, taught art at the Indian School and we lived on campus when I was 2-5 or so. He also had a studio he shared with another artist for awhile. Both my parents are unreliable sources of information due to advanced age. However, I cannot ever recall my father disputing my grandfather as to the “screwy” stuff, but he also never commented on the artist and may have known him also. When I say things are strange in it, I am talking about, for instance, a rabbit that is running out from under the horses hooves that does not come accross as sized proportionately. The pony also has one black (lower, just over the hoove) foreleg and just doesn’t seem to be as thick as it should be if it were healthy. One of the bigger things to me was the tree branches. They appear out of the sky, the middle one as if the point of view is from the tree trunk itself. Anyway, I am horrible at the supposedly easy access camera I have and putting pics on the computer or emails, so it may take me a few days to get you descent pics be we can work it out one way or another. Thank you so much for responding. I just listed a nice little Tahoma on ebay of a Navajo Child With Pets. I have a photograph by T Harmond Parkhurst who was a well known photographer in Santa Fe. He was my late husbands great uncle. Supposedly some of his photos were hand painted over by I was told a artist that worked at Disney studios. I have been now told that maybe Mr. Quincy may have painted over some of his photographs. I am just trying to find out more about my painting. If you have any information on whether Mr. Quincy was connected to T Harmon Parkhurst , please let me know. Barbara, we have also been told that Quincy Tahoma painted some of Parkhurst photos, which probably happened. And we’ve heard the rumor about the Disney studios, but do not believe it is true. 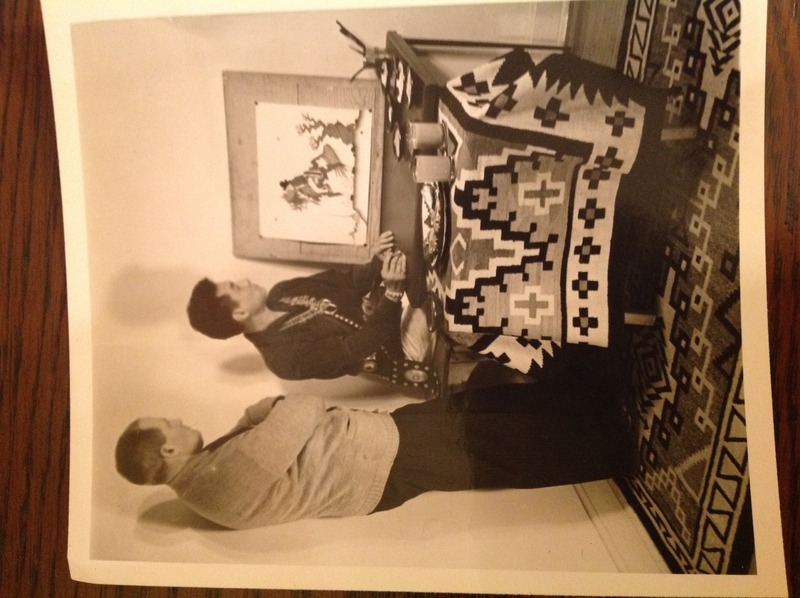 We’ve written several times about T Harmon Parkhurst, and included information in our book, Quincy Tahoma: The Life and Legacy of a Navajo Artist about Tahoma’s experience with Parkhurst as his mentor. To find references to Parkhurst here at Tahoma Blog, put his name in the search box at the top of the right-hand column. I have a lovely Tahoma painted in 1954. “Hunting Buffalo” We lived/live in Santa Fe, I believe my mother bought it from Quincy. She gave it to me as a wedding gift in 1957. His signature on this work is Tahoma in all capitals below a little animal horse maybe – above a straight line the length of Tahoma. Thank you so much for telling us about the painting, Merta. Tahoma’s paintings are treasures in and of themselves, but to have been given one as a wedding gift makes yours quite special! We have two nice QT prints, King of the stallions and the last jump and would like to find a value for them at least for insurance purposes. Here is a link to a photographed image of a photograph I found that looks to be Quincy Tahoma standing with my great uncle Simon. There are also a few photographs (likely taken by Herta) of a “Buffalo Dance”. What an exciting find for you. That is definitely Tahoma. We had seen a few pictures of him posed with that blanket-covered table. I have recently acquired a print of Quincy Tahoma’s entitled “Going To The Chant” which is numbered 166 of 1000. Can you tell me or can you direct me on what the value of this print might be? I was totally amazed to learn that Mr. Quincy was a “Code Talker” during WWII! How awesome! Thank you. The Code Talker legend is only one of many that we proved to be untrue. He was in Santa Fe all during the war. Not able to enlist because of his crippled arm. When I was a young boy Mom or Dad hung a copy of a painting in our room. It was an Indian hunter with a deer on the back of his horse and a hungry cougar staring down from a tree over head. Dad thought it was by Quincy Tahoma. It looked very similar to his painting “Surprise!, Surprise!” but not exactly. It was less surreal and more graphic (in my untrained eye). Does anyone have a clue where this painting might be….been searching for forty years…Thanks! Fantastic find, Alex. Thank you so much for sharing it! As you probably noticed, the photograph above of Tahoma comes from that film. This is a totally different film than the one we saw previously at Amerind Foundation. Although there is a lot of phony, hokey stuff, it is fascinating to watch him paint, isn’t it?